Hay bales, whether round, cubed, stacked, or piled are irresistible to an artist! They catch the light and define a landscape. I love painting them. 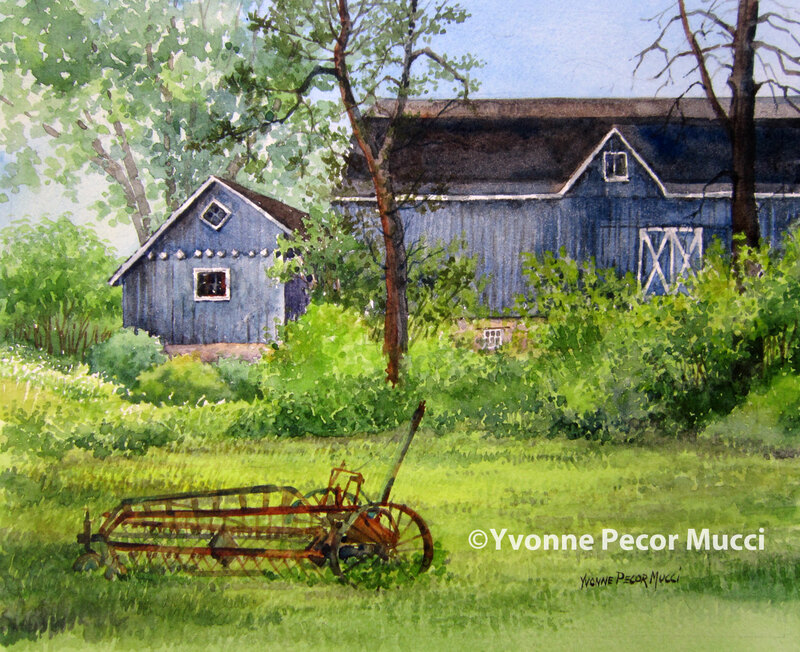 “Hay Bales” watercolor was painted for the Plein Air Brandywine Valley competition. 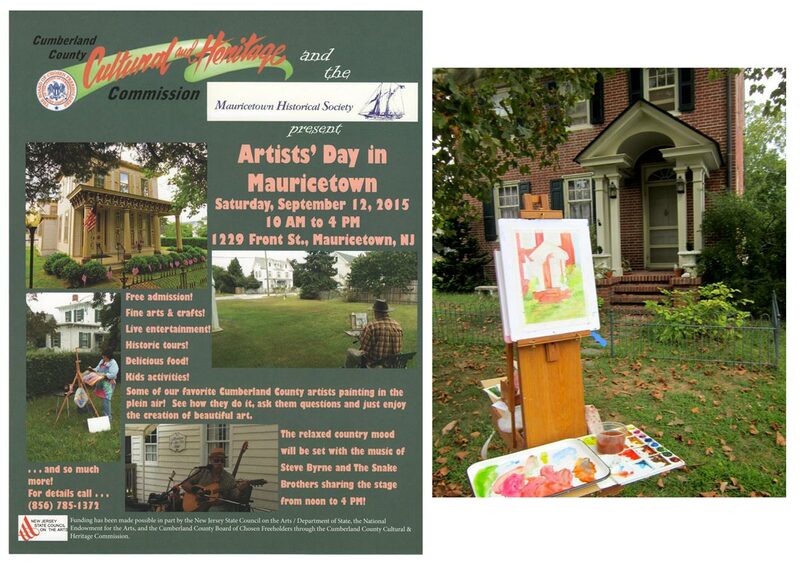 I spent a lovely fall afternoon painting with other artists at this beautiful location. 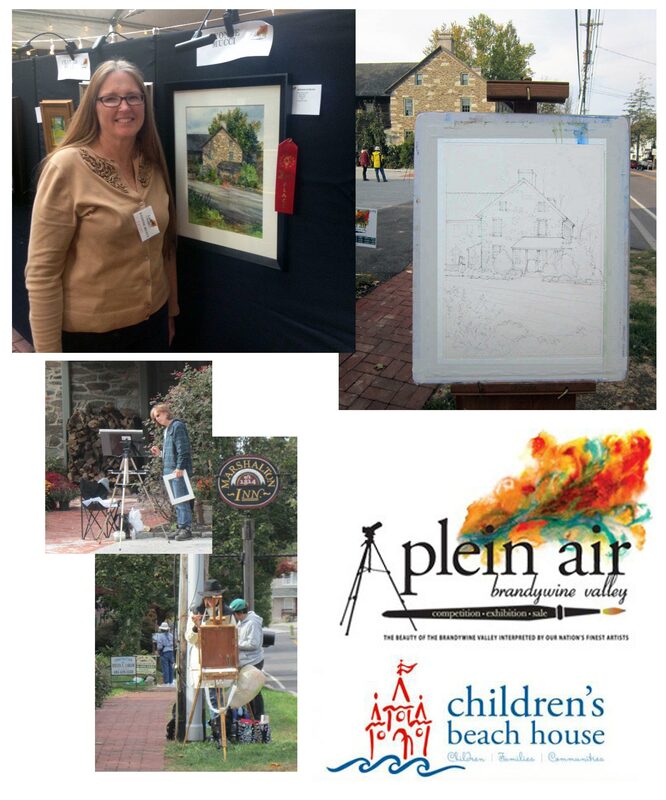 Applications for the 2019 Plein Air Brandywine Valley competition are being accepted now. This is a well organized event with fabulous locations. Best part is that proceeds from this event benefit Children’s Beach House, so get involved. 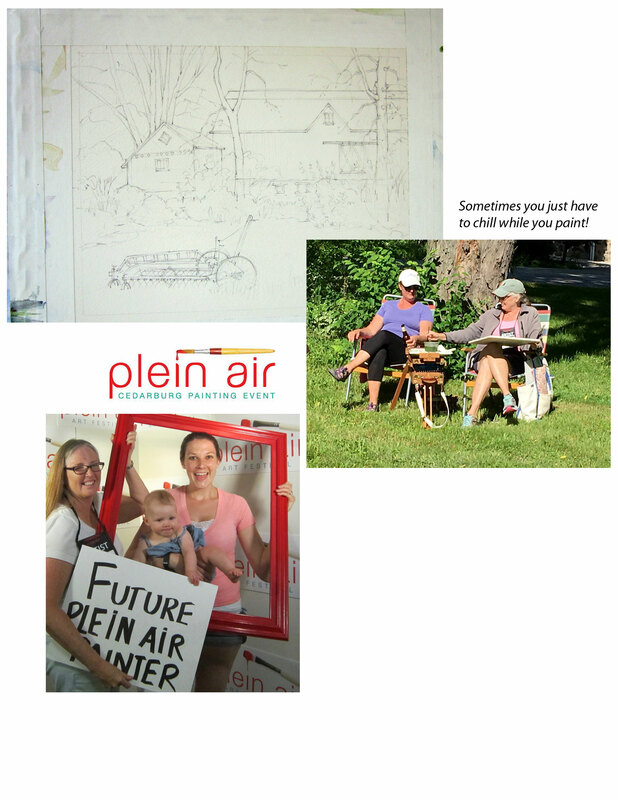 cbhinc.org Attend the 2019 Plein Air Brandywine Valley Opening Reception on Friday, October 18, 2019 at Winterthur Museum, Garden & Library. 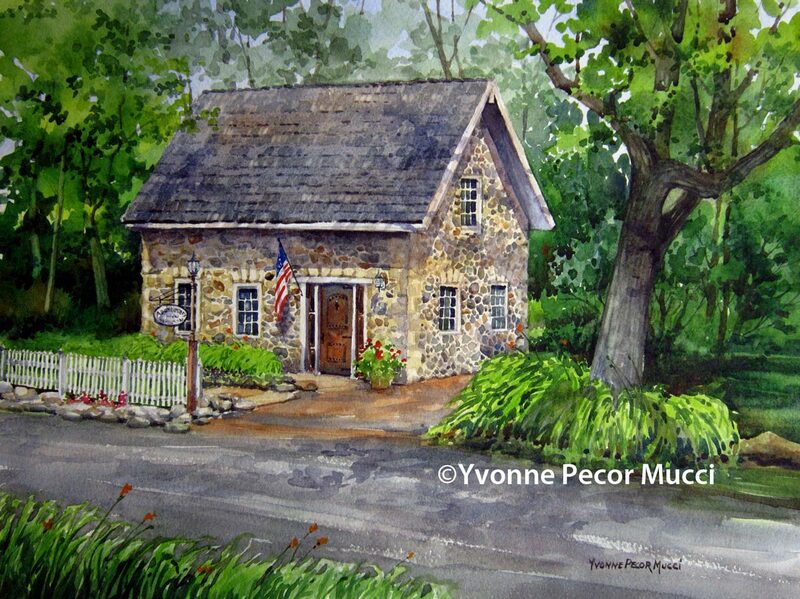 For information on any of my paintings mucciyvonne@yahoo.com ©Yvonne Pecor Mucci, all rights reserved. 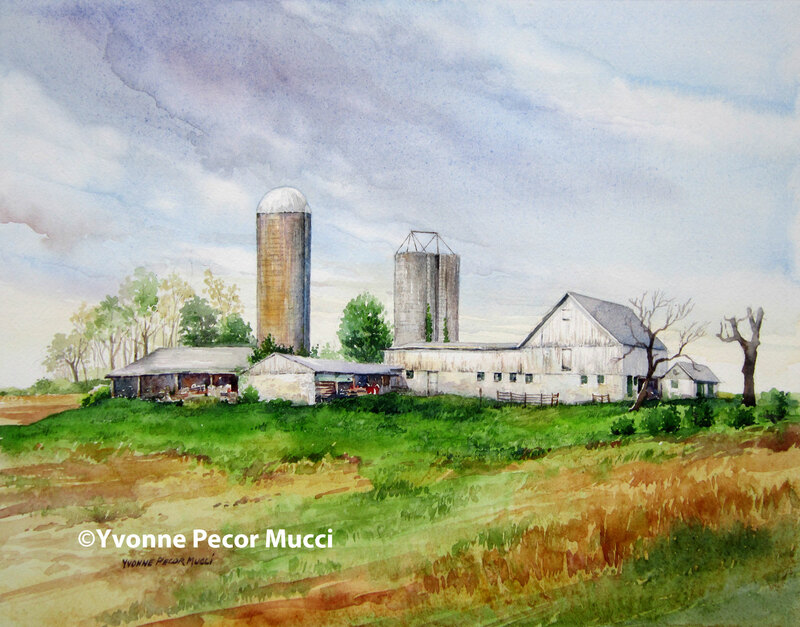 “Watch Over Me” was painted during Plein Air Brandywine Valley competition held every fall. Brandywine Wilmington Cemetery was one of the locations for this day and I did not know what to expect when arriving, but it is a pretty historical place. While figuring out what I could possibly paint there, I looked up and the fall colors were exploding behind this statue making the angel look like it was rising from flames. It was so quiet here that the painting almost painted itself. 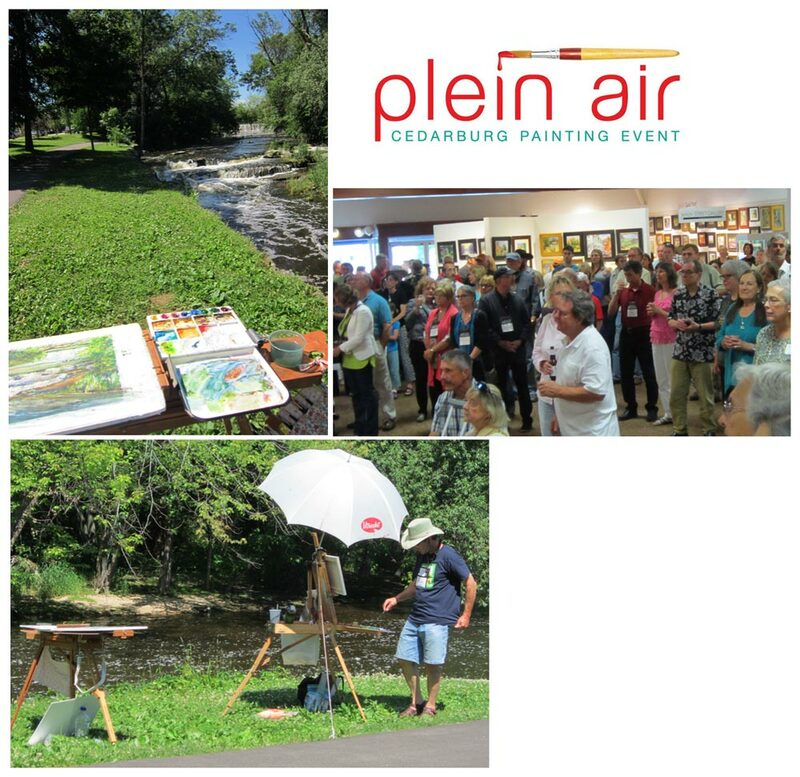 Attend the 2019 Plein Air Brandywine Valley Opening Reception on Friday, October 18, 2019 at Winterthur Museum, Garden & Library. As far as painting locations go, one can never go wrong with Winterthur Museum and Gardens. 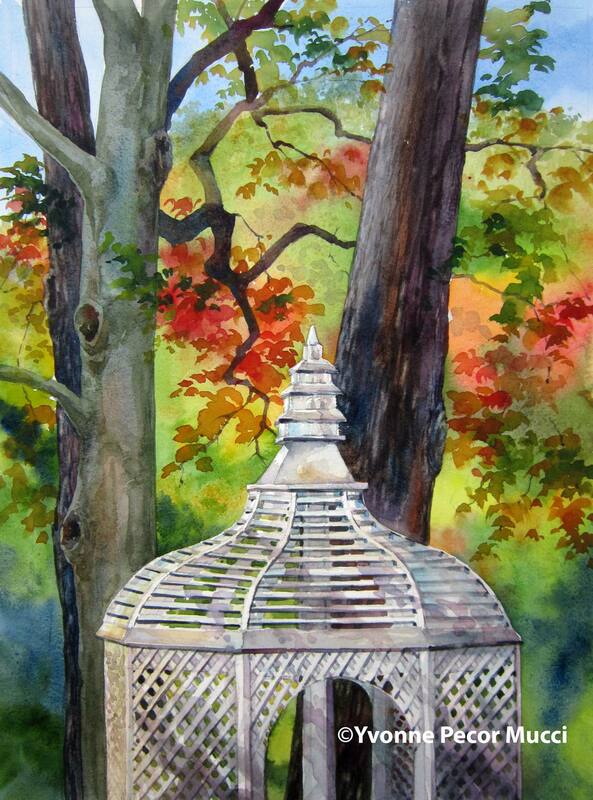 Day four of Plein Air Brandywine valley was spent near the gazebo. I wanted a different subject that played against all the bursting fall color. 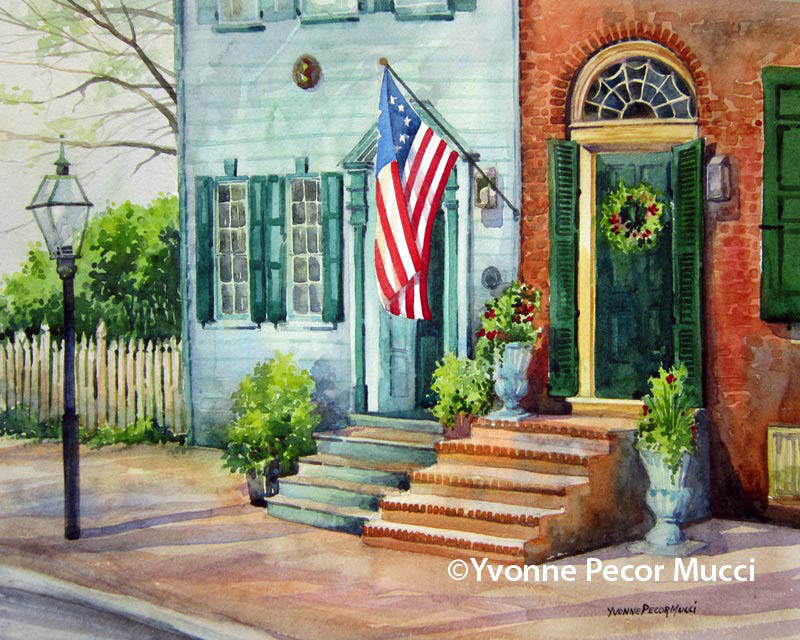 This painting was donated to Children’s Beach House to be sold during their Winter White event on December 4th. Children’s Beach House is a nonprofit that focuses on special-needs children. 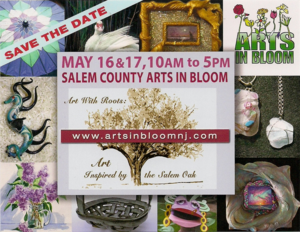 http://www.cbhinc.org What a fabulous event for a great cause! 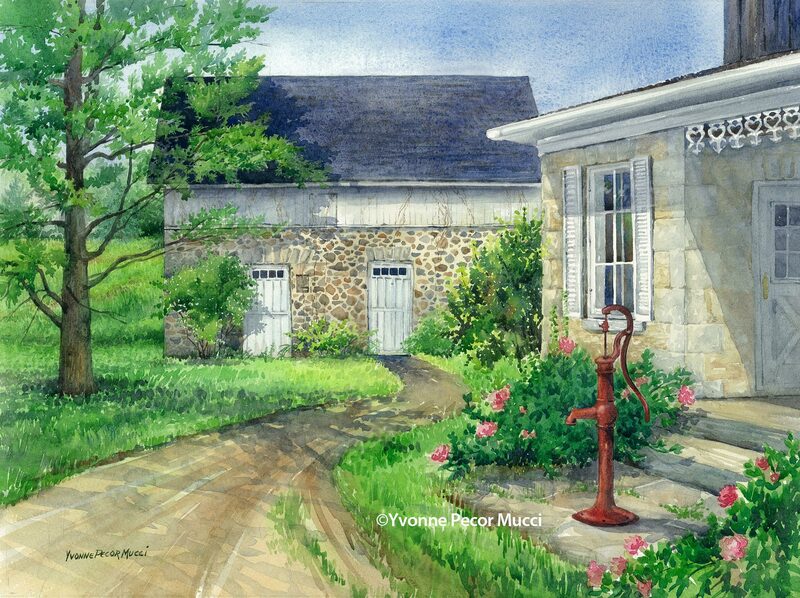 Welcome To The Inn watercolor depicts the Marshalton Inn located in Marshallton, PA. 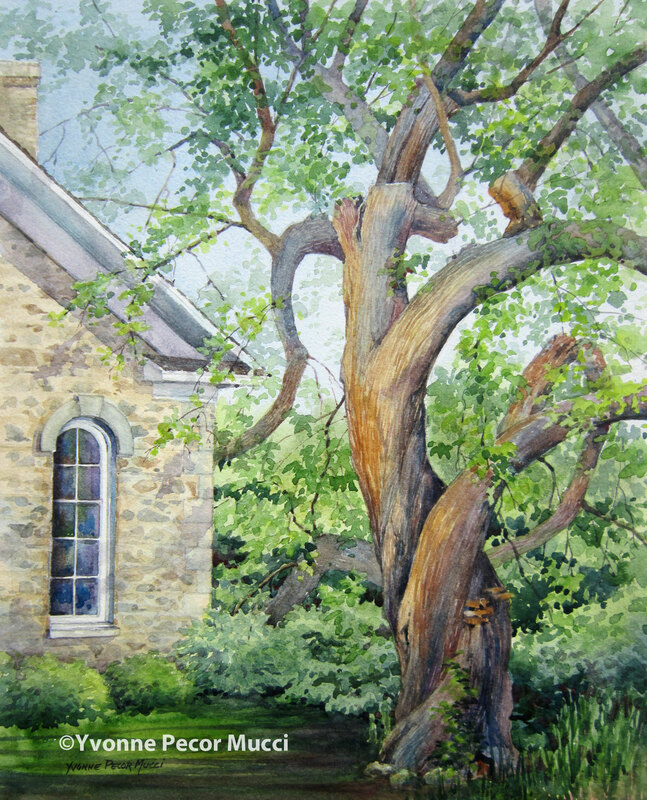 This was my choice for day two of the Plein Air Brandywine Valley competition. 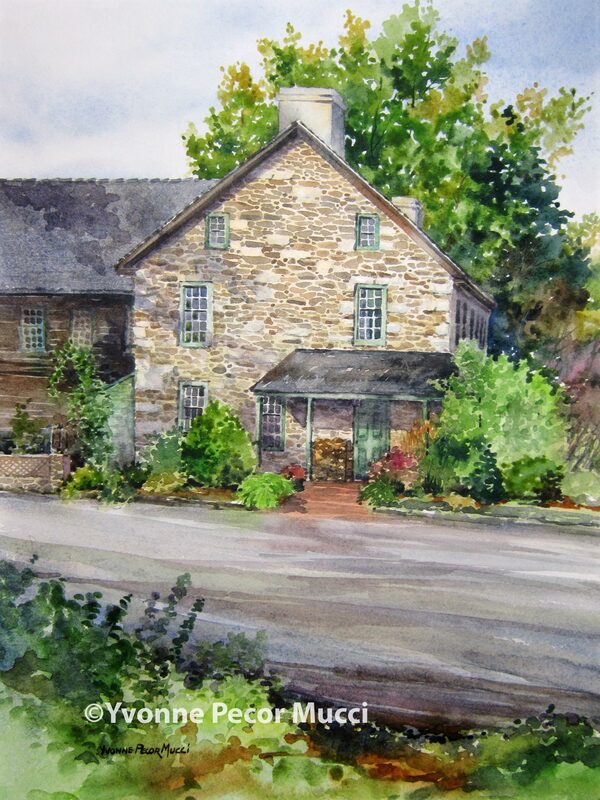 There are many beautiful historic buildings along Strasburg Road located about four miles west of West Chester. 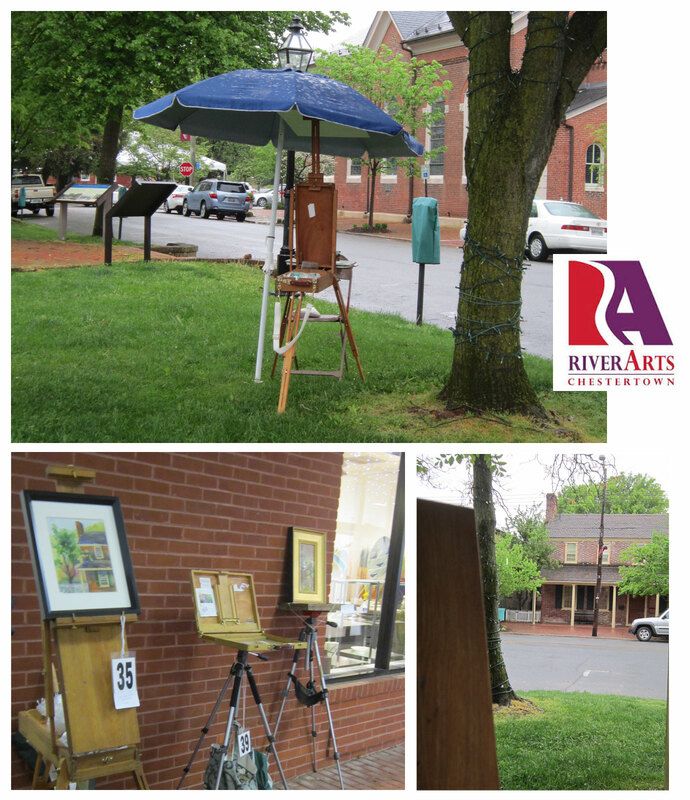 The town was filled with artists and photographers capturing the many subjects along the main street. Amazing day! I love the stone work on the Inn and the way the shadows cast across the different textures. 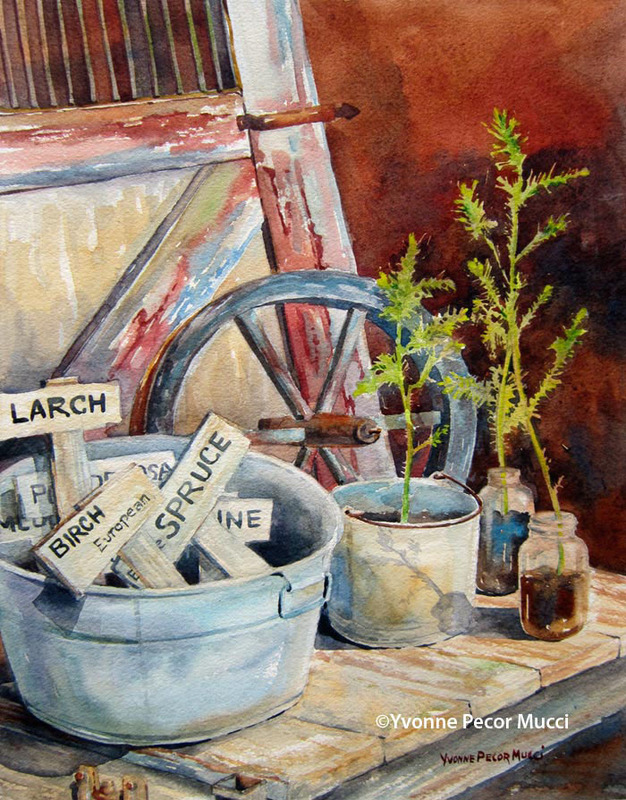 It was quite the challenge, but well worth it because I received the honor of 2nd place for this watercolor. Such a thrill when your name is called, especially when you were not expecting it! Thank you to everyone who enjoyed my painting enough to choose it as a winner. The Marshalton Inn hosted this event which helps out Children’s Beach House, a nonprofit that focuses on special-needs children. 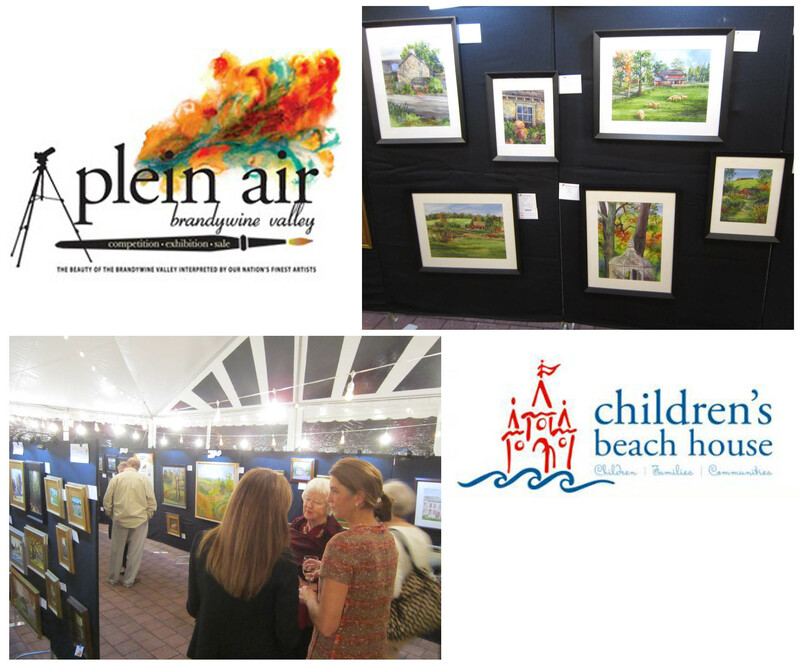 www.cbhinc.org Every sale benefits Children’s Beach House. 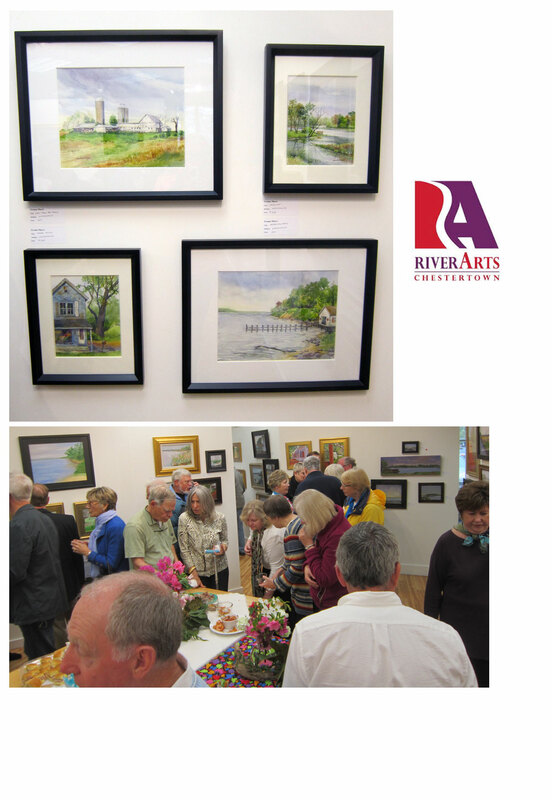 Thank you to the owners and staff of the Inn were so very accommodating to all of the artists. 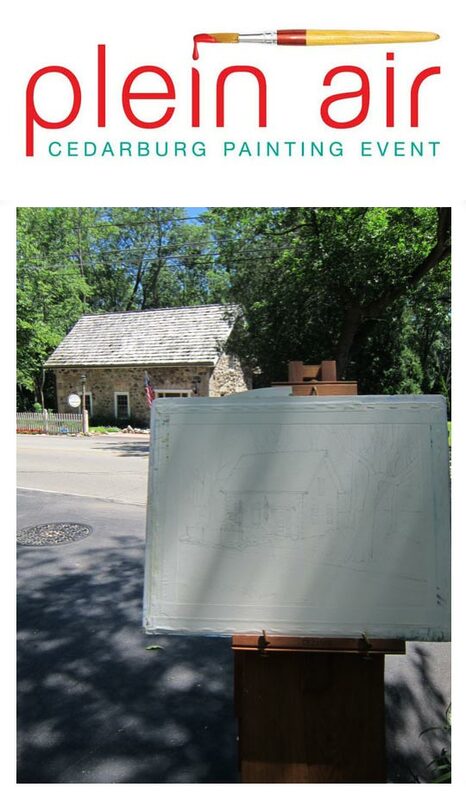 It was a nice hot sunny day in Cedarburg, perfect for painting en plein air. The moving water of Cedar Creek was both mesmerizing and challenging. The cool water running over the dam and cascading down the rocks mid creek was bright white in the sunlight. 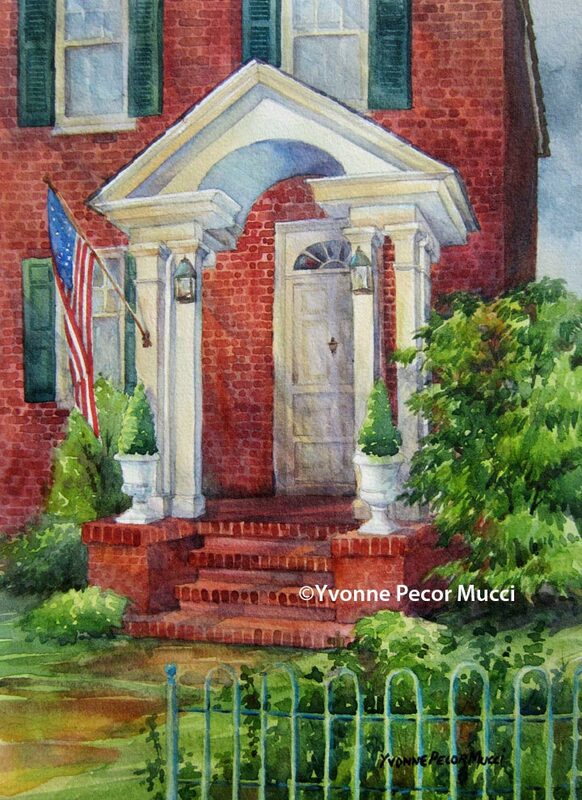 My goal in this watercolor was to preserve those whites along with trying to keep a loose feel to the painting. 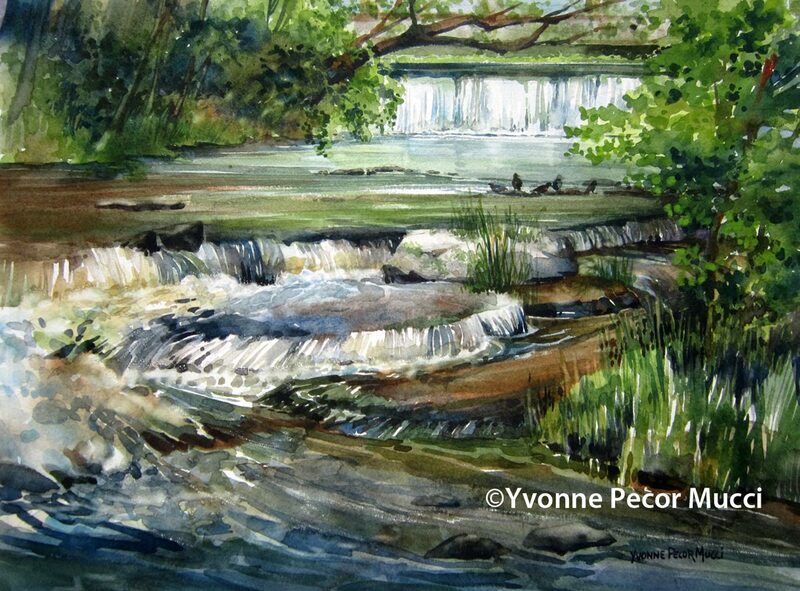 This location was popular and it was nice to have the company of other artists while painting. Each artist’s view was completely different even though we were standing only a few paces apart. If you blink, you’ll pass this little gem in the Hamilton Historic District. This Apothecary Shop, built between 1860 and 1864, was a general store before and after the civil war. It is now a beautifully restored private home. The owner graciously gave me a tour which made me we wish this quaint historic stone building was mine! Thanks to the Rasmussen family who let me paint in their driveway! 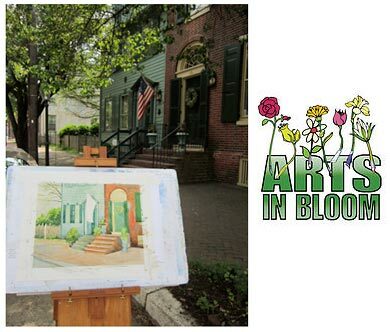 Last week I was one of 160 artists participating in a plein air competition. 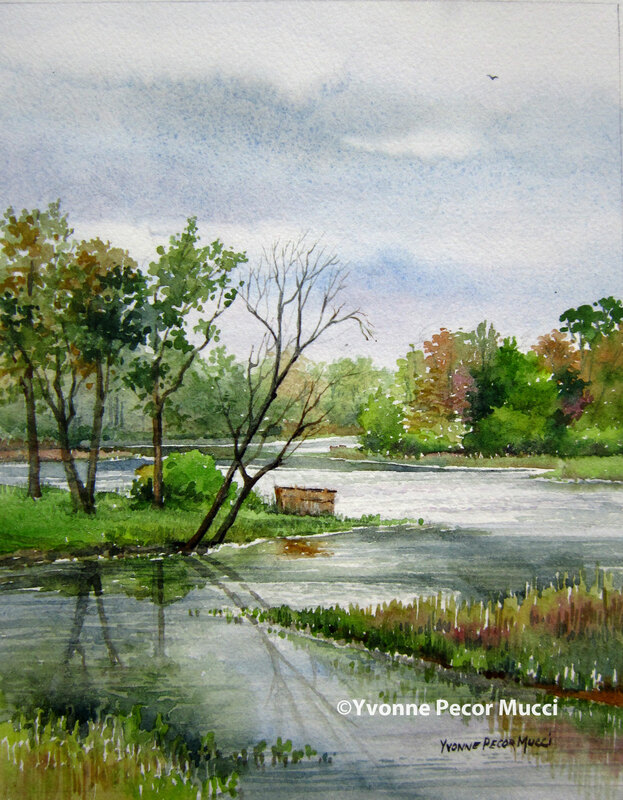 The weather was a mixed bag, fog, mist, rain and sun which made watercolor painting a real challenge. 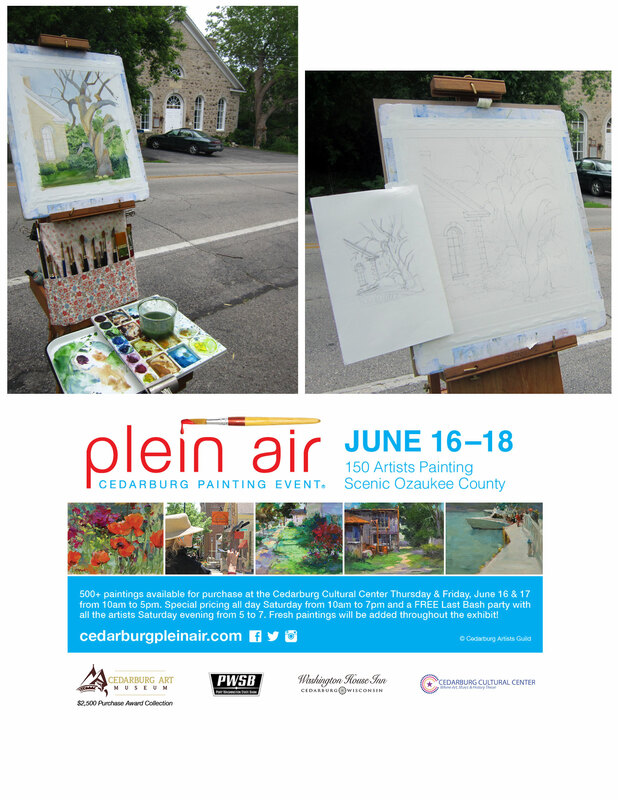 Still, it was a fabulous week of painting throughout the town of Cedarburg, WI. There were so many interesting subjects to explore in a week! 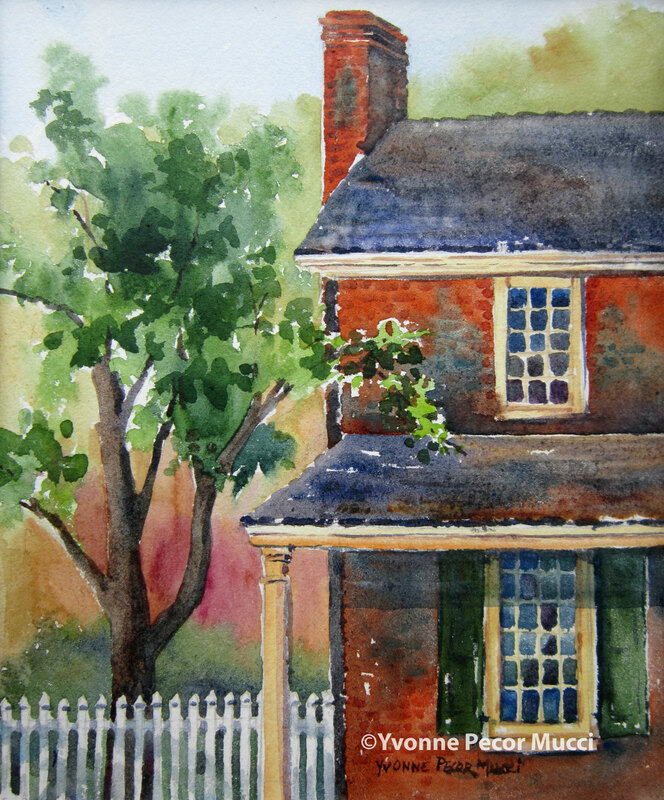 “The Harness Maker’s House” watercolor is of the Charles Hinze House, a harness maker (circa 1860s). The view looks west past the original well pump to the rare story and a half fieldstone barn. This glimpse of a bygone era can still be enjoyed while driving down the original Green Bay Road in Historic Cedarburg. Thank you to Ray, Sarah and Noah for being the very best hosts! I could not have had a successful week without you guys.